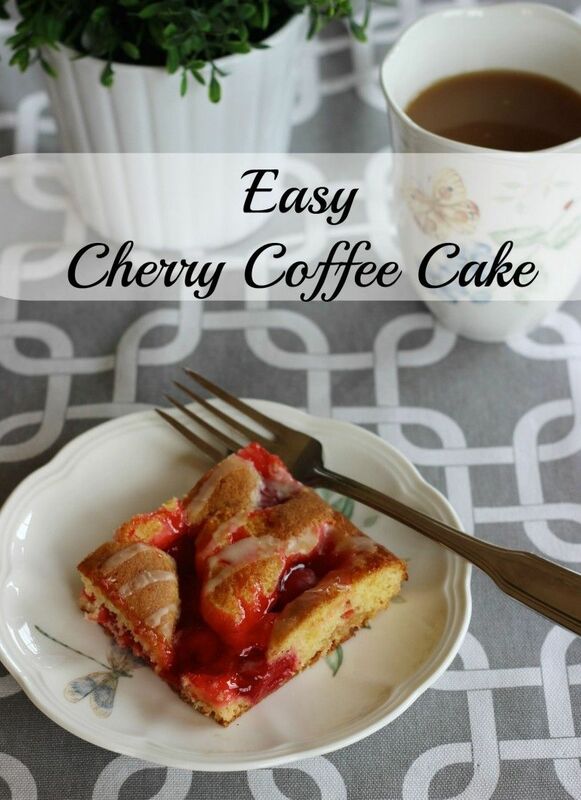 I’ve made this easy and quick cherry coffee cake a few times now. It is really good. It’s one of those recipes you can whip up quickly and easily as long as you keep a couple of the key ingredients in your pantry. I decided to try to make one after I bought a little coffee cake in the grocery store. It was gone in a couple of hours. And, when I threw out the empty package, I noticed the price. Yeah, I paid the price for convenience! But sometimes, a dessert just looks sooooooo good! I found a couple of cherry coffee cake recipes and simplified them for you! 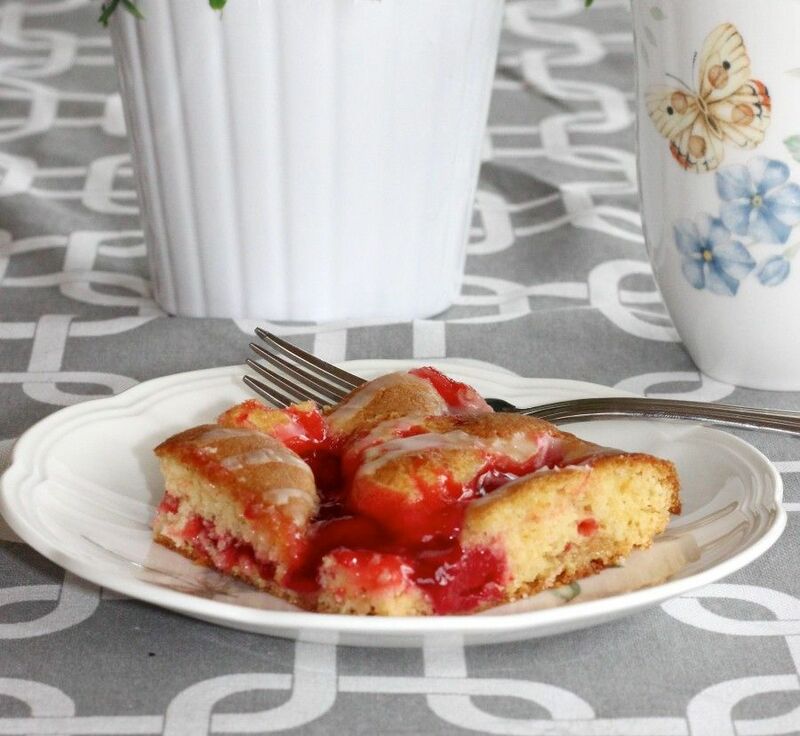 This cherry coffee cake recipe is easy and starts with a cake mix. 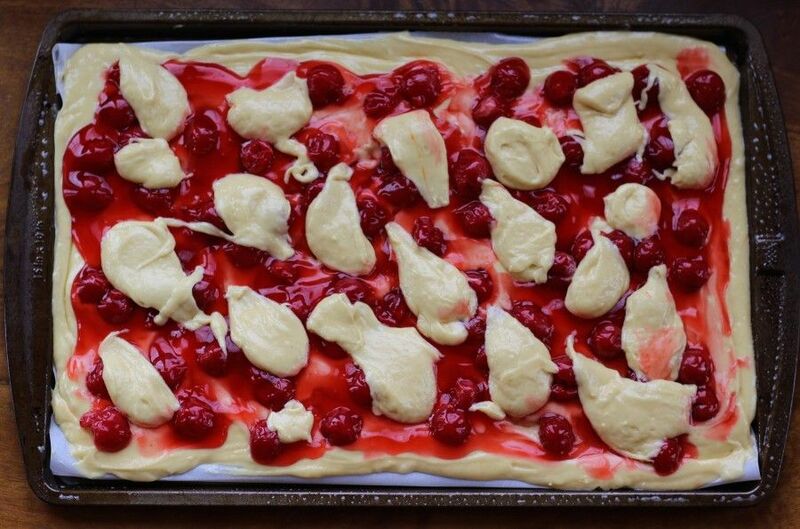 You just need to add a few ingredients and then layer the dough, the cherry pie filling and then glob on some of the rest of the dough. It looks really good, even before it is baked. Yes, this recipe is a huge success with my family. It makes a great sized pan so can serve a crowd. It’s light and fruity and perfect to bring along when you need a dessert to share. 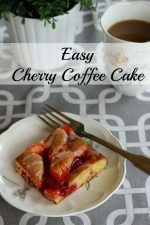 I hope you agree that this is an easy cherry coffee cake. And no, you absolutely don’t need to like coffee. My teens were asking why it’s called coffee cake. I had to explain that in the ‘olden days’ people socialized more at each other’s homes. They would have a coffee and a dessert, hence the name. But, I digress. This recipe is absolutely delicious. If you like this recipe (because it tastes good, looks good and is easy to make), you will like the following recipes too! The recipes below are all recipes I make with items I have at home. When I want something that tastes good, and I am running low on time. « My door lock adventures – skeleton key, mortise lock and doorknobs. Want to kick the flavor up a notch? Use Brandy extract instead of Vanilla- makes this dessert more adult. Yum. This looks and sounds so good. We are getting ready to visit some old friends soon for the weekend and I wanted to bring something to their house. This will be perfect. Thanks!